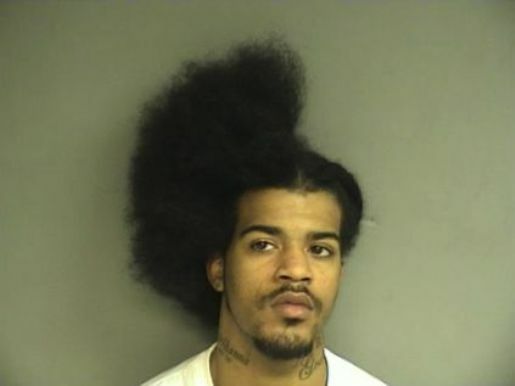 The half-fro, a hair trend for the modern scissors-stabber. It’s not the Obama haircut, but David C. Davis, 21, of New Haven, Connecticut had a pretty distinctive hairstyle when police picked him up. Davis was getting his hair done in Stamford when he apparently grabbed a pair of scissors and stabbed another man in the barber shop. After stabbing the other man in the back, David Davis fled from the barbershop with his hair half-cut. Part afro, part styled, and all crazy. Did he really think he was going to get away? I mean, I’m no identification wizard, but even at night I could pick this guy out of a lineup. “Yeah, he’s the guy with a half-fro, half-corn row hairstyle. You can’t miss him!” I mean, I can understand running from the barber shop if your life is threatened, but to run from the cops with the most distinctive hairstyle ever? Not the best idea. If anything, this guy needs a display in the hair museum for his epic locks. This is pretty remarkable hair. Just imagine if this kind of half-done hair catches on and becomes the popular style!